Russian engineers are installing a giant railway arch in the channel between Russia and Crimea, as a 19km (12-mile) road-rail bridge takes shape. It is a flagship political project, as Russia claims Ukraine's Crimea peninsula - which it annexed in March 2014 - as its own territory. It will take about a month to fix the arch, weighing 6,000 tonnes, to massive supports in the water. The road section of the Kerch Strait bridge will also have a giant arch. The project's official website (in Russian) - www.most.life - says the bridge should be completed by the end of next year, when the first cars will cross it. Then rail traffic will start crossing it in 2019. The EU and US have ratcheted up sanctions on Russia since first imposing restrictions over the seizure of Crimea. Western firms and politicians are banned from doing business with the Russian-installed Crimean government, or with Russian economic actors there. Russia's Vesti TV news says the Kerch Strait bridge will be Russia's longest. The bridge will not impede shipping, the project website says, as it will stand 35m (115ft) above the water. The four-lane highway is designed for a capacity of 40,000 vehicles per 24-hour period. According to a Ukrainian think tank, the bridge will be too low for some cargo vessels to get through to the Ukrainian port of Mariupol, north of the Kerch Strait. The Center for Army, Conversion and Disarmament Studies said the restriction could mean a 25-30% loss in the port's trade and could hit pig iron exports to US customers. What is Russia's end game in Crimea? 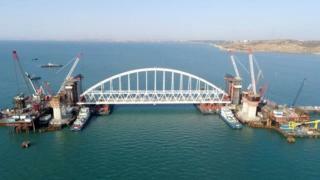 Russia sees the bridge as a key strategic tool for developing Crimea, more efficient than the current ferry service. Crimea's land border with Ukraine is tense and heavily militarised, making cross-border deliveries slow and difficult. Ukraine and Western governments accuse Russia of crushing political opposition in Crimea, whose leadership is solidly loyal to President Vladimir Putin. Ethnic Russians are the majority group in Crimea, which used to be part of imperial Russia. In April 2016 the Crimean Tatars' Mejlis - an assembly representing the ethnic group's interests - was banned by Russia as an "extremist" organisation. Ruslan Zeytullayev, a Crimean Tatar activist serving a 15-year jail term in Russia's southern city of Rostov, has sent an open letter to the UN, urging international pressure on Russia to get "political" prisoners released. A month ago he went on an indefinite hunger strike. Russia found him and three other Crimean Tatars guilty of membership in a "terrorist" group - Hizb ut-Tahrir - and jailed them all. The group is not listed as "terrorist" in Ukraine. Amnesty International said the case raised "numerous fair trial concerns" - notably, several prosecution witnesses had retracted their pre-trial statements. A leading Crimean Tatar activist and deputy head of the Mejlis, Akhtem Chiygoz, is expected to be sentenced by a Russian court on 11 September. He is accused of organising "mass disturbances" during a pro-Ukrainian rally in 2014 before Russia's annexation of Crimea. Update 8 September 2017: This story has been updated to reflect Ukrainian concern about the bridge's impact on shipping. The Zimbabwean president leaves house arrest to attend a university graduation ceremony.